The story of Fred and Judy Baron feels like it is straight out of a romance movie: they met on July 4, 1980, in Coronado, California, at a wedding where he was the best man and she was the maid of honor. 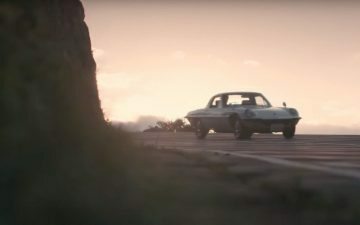 They started dating that very night, but since he’d flown in from out of town, leaving his ’79 Mazda RX-7 at home, he took her out for a spin in the Groom’s ’79 RX-7. Soon, they were dating, and Fred was helping Judy shop for her own RX-7; it wasn’t long after that when the couple were announcing their own engagement with a photo of their nearly-matching Mazdas. “The stuffed Mazda on the hood of my car (in the engagement photo) was prophetic of our son to come in later years,” Fred said. While the Barons had another Mazda RX-7, an ’86, in the early years of their marriage, they slowed down when their son was born in 1991. After several family sedans, Fred decided he was ready for something smaller and a little more robust once his son grew up and moved out on his own. 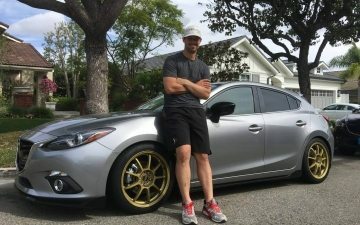 He decided on a Soul Red 2014 Mazda3 GT sedan, which has plenty of space for the skiing and kiteboarding equipment he frequently takes on trips. He drove 100 miles to the dealership that had exactly the model he wanted, and even brought his sports equipment with him to make sure it would all fit. He and Judy have driven it all over California, Nevada, and Arizona. “I fell in love with the concept of a driver-centered vehicle, especially the Active Driving Display,” Fred said. His Mazda3 came fully equipped with the Technology Package, with safety features such as radar cruise control, blind spot monitoring and lane-departure warning. “That technology, along with the lively feel of the car, has made me a much more confident, relaxed and safe driver, especially on long trips,” he said. From his very first RX-3 in the ‘70s to his current Mazda3, Fred keeps coming back to Mazda for vehicles that give him the same “wow” feeling that he first felt in 1972.